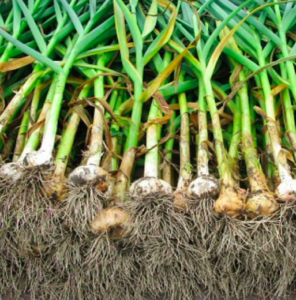 Garlic crop cultivation is one of the most important bulb crop cultivations. It is mainly used as a spice. Garlic is considered as a rich source of carbohydrate, protein, phosphorus. Vapour oil is found in garlic. Garlic helps in indigestion. This reduces cholesterol in human blood. Garlic can be cultivated in many different types of climates. However, it can not be cultivated in very hot or cold weather. Short days are very favourable for the formation of bulbs. It can be grown well at the height of 1000-1300 meters sea level. The first plowing rotate upper 15-20 com soil. Deep plowing should be done. Before this, the cultivator should be used two or three times, so that the lumps get broken and the soil becomes frostbitten. Weeds should be removed with root and weeds, such as dub or moth. In the field, add 20-25 tons of well-mixed dung compost and mix it well with harrow in the soil. Planting garlic in well-prepared fields keeping in mind the types of land, weather, amount of rainfall etc. is important. Garlic cultivation is mainly done in moderate sandy loam soil. Soils with good quantity of potassium is considered good. Garlic is the crop which is grown under the ground, whose roots penetrates to a maximum of 20-25 cm from the ground. Loamy soils with good drainage are considered as excellent. Well, garlic can be grown in other lands also. Heavy soil is not suitable for garlic cultivation, because it does not have proper drainage due to the proper drainage and tubers remain small, due to which the garlic should not be applied in heavy soil. The pH value of the land should be between 5.8-6.5. 400-500 kg for garlic seed per hectare is sufficient. Garlic is cultivated in Rabi and summer days. This can be done by August-November. Selection of seed cloves is important for planting garlic. Separate the seeds cloves from the full bulb. Large seed cloves should be selected for planting. Small, diseased and damaged seed cloves should not be selected. Seed cloves should be treated with Carbendazim solution of 0.1 percent, which can reduce the effect of fungal diseases. Seed rate for garlic is 400-500 kg per hectare is sufficient. Selected cloves should be placed at the distance of 10 cm. Germination of garlic buds occurs in 7-8 days. But after three to four days of planting seed cloves, weed germination takes place. Thats is why, proper weed management is very urgent need and important in garlic. Use Pendimethylin 30 EC 3.5-4 ml/litre of water or Oxypoflorophen 25 ratio EC 1.52ml/litre of water for chemical management of weed in garlic. Spray can be done before sowing or after sowing garlic seed cloves. Dung compost 200-300 q/ha and Nitrogen:Phosphorus:Potash::100:50:50 kilo per hectare is required. At the time of preparing the dough’s compost, full quantity of phosphorus and potash and 1/3 of the nitrogen during the preparation of the land and the remaining quantity of nitrogen divided into two parts. One at 25-30 days of transplantation and second at 40-45 days. The first irrigation is given after sowing. In the beginning, the requirement of water for the garlic crop is light but at low intervals, irrigation should be done immediately after transplanting in the dry field. There is a need for adequate moisture in the field till new stems are developed. Therefore, after two or three days of irrigation, the second irrigation requirement is required. Once the plants are established, the water requirement is reduced in the initial time. But as plants grow, their water requirement increases. By the beginning of the formation of lump in the plants, irrigation is required for regular completion of tubers (till 60-110 days of transplantation). Irrigation is done at an immediate interval of transplantation, and according to the weather, irrigation is done after 10-12 days in the Rabi season (November-January), and at an interval of 7-8 days in the month of February-April. Garlic is a crop of 4 to 5 months period. When the leaves begin to become yellow or brown and show signs of dryness then plants are ready for harvesting. Take out the plant with the help of hull and leave it for at least 2-3 days to dry in the field so that the quality of the bulb is kept on long sized bulbs or dry dry sand on the floor in a well ventilated room on the dry floor. 50-70 q / hectare of garlic per hectare is obtained. Temperature and relative humidity are important factors for storage of garlic for longer periods. Humidity greater than 70 percent is the biggest enemy of garlic storage. It also increases the outbreak of fungus and garlic starts rotting. On the contrary, if there is less humidity (higher than 65 percent, the garlic has higher proportion and the reduction in weight starts decreasing. For long-term storage, the reservoir houses should have a temperature of 1°C and humidity between 65-70 percent. In the months of May-June, due to high temperature of the reservoir houses and reduced moisture, weight loss is high.